The debate on Capitol Hill over Iranian sanctions is set to intensify in the coming weeks with House Majority Leader John Boehner extending an invitation to Israeli Prime Minister Benjamin Netanyahu to speak before a joint session of Congress. Netanyahu will likely trumpet the same song heard before at the UN General Assembly and his previous Congressional address in 2011, perhaps changing the beat to hasten the tempo and add more urgency to the West's diplomatic dance with Iran as the hour grows late. That the remix of the song will contain the same verses and choruses reflects the reality that his tune has yet to be fully appreciated by the White House. And given Mr. Obama's decision to forgo an audience with the Israeli leader when he arrives in March, he does not appear to be listening. Their acrimonious relationship is unfortunate as it is increasingly clear that when it comes to Iran and the threat matrix coming from the Middle East, the two leaders aren't merely striking discordant notes on versions of the same song, but are singing entirely different tunes altogether. The lack of harmony was audible in President Obama's State of the Union address. If taking the speech at face value, one could not be faulted for concluding that recent negotiations with Iran have been fruitful and will likely lead to a deal. The only roadblock would be an intransient U.S. Congress bent on passing sanctions. If the talks fail, the White House will point the finger at Congress and Israel will also share the blame for answering the call to press its case again. In reality, there has been growing frustration among those keeping score of the Iranian nuclear chess match. The sanctions that the White House begrudgingly put into place were the only reason Iran came to the negotiating table. And despite their partial enforcement, they took their toll. In the first ten months of 2012, Iranian currency dropped like a stone, losing more than 80 percent of its exchange value. It therefore made little sense to substantially ease the pressure on Iran in exchange for such paltry concrete achievements. Questions about the approach were not just within the purview of the political right in Washington. Two former Obama administration officials, Dennis Ross and Ray Takeyh, who were tasked with the Iran portfolio recently admitted, "it is time to acknowledge that the policy of engagement has been predicated on a series of assumptions that, although logical, have proven largely incorrect." Then came the Joint Plan of Action (JPOA) agreement reached on November 24, 2013. Instead of trading a measured rollback of sanctions for a complete cessation of Iranian uranium enrichment, it provided enough relief to shift Iran's economic footing from recession to recovery. According to a joint report by the Foundation for Defense of Democracies and Roubini Global Economics, total sanctions relief during the first six months of the interim agreement amounted to around $11 billion—not $6-7 billion as the Obama administration originally pledged. Moreover, the JPOA surrendered crucial American leverage and left key sectors of Iran's nuclear program untouched, all the while allowing their centrifuges to continue spinning. Despite President Obama's State of the Union assertion that "for the first time in a decade, we've halted the progress of its nuclear program and reduced its stockpile of nuclear material," reality has proven to be quite different. As The Israel Project pointed out, "the Iranians have spent the last year exploiting loopholes in the interim deal," advancing on each core area of their overall program, namely, their uranium and plutonium paths to a nuclear weapon, and their ballistic missile program. Days after the JPOA was signed, Iran announced that it would proceed with enrichment at its Arak heavy water reactor. While not allowed to bolster the physical reactors themselves, it persisted with the construction of parts offsite in preparation for installation. Iran also continued to enrich uranium up to 3.5 percent—which represents 60 percent of the effort required to produce weapons-grade uranium. It already enriched enough uranium to produce two 1,000kg bombs and will produce enough for one more this next cycle. Progress on their ballistic missiles has also continued unabated with recent assessments putting them on track for significant Intercontinental Ballistic Missile (ICBM) progress by the end of the year. Then there are the twin revelations this month that Iran plans to build two light water reactors that would be able to enrich plutonium for weaponization, and a report by Germany's Der Spiegel uncovering an underground nuclear-related facility in Qusayr, Syria. Within days of the report's release, members of the Free Syrian Army in the area confirmed Hezbollah's "unprecedented" security presence at the suspect facility under Iranian supervision. With what's left of Assad-controlled Syria now managed and operated by Iran, these new nuclear facilities provide Tehran with strategic depth and additional negotiating leverage. And since Iranian developments in Syria lie outside the confines of the JPOA, State Department Deputy Spokeswoman Marie Harf explained that the U.S. is not even going to raise the issue with Iran in the next round of talks. The palpable sense of unease with the unfolding U.S.-led negotiations was to be relieved by President Obama's reassurance on the eve of the interim deal's announcement on November 23, 2013. He promised, "If Iran does not fully meet its commitments during this six-month phase, we will turn off the [sanctions] relief and ratchet up the pressure." But the talks were extended in July 2014 for four months, followed by a seven-month extension in November 2014 with no corresponding pressure. It is therefore puzzling to hear President Obama so concerned about the appearance of a good faith effort on the part of the United States. Flipping his own script, during the State of the Union address he declared that, "new sanctions passed by this Congress, at this moment in time, will all but guarantee that diplomacy fails—alienating America from its allies; and ensuring that Iran starts up its nuclear program again." But the "new sanctions" aren't new at all. Obama is referring to the bipartisan-supported Menendez-Kirk legislation in the Senate, which is a diplomatic insurance policy only set to kick in if the talks fail. The president would still retain unlimited waivers to stave off the escalating pressure as long as he could verify that talks are progressing. Congress is essentially seeking to put back an arrow in Obama's quiver that he misfired earlier in the negotiations. The recent terror attacks in Paris brought ISIS and al-Qaeda back into focus. To the extent Mr. Obama considers the Middle East, he appears to view ISIS as the core problem, followed by the al-Qaeda forces he previously claimed were decimated. Iran's nuclear ambitions rate further down the list and even represent a bonus since its resolution will ensure the president's foreign policy legacy. It is this morass that awaits the Israeli leader when he comes to Washington and it is why the two leaders are marching to different beats. Iran, its nuclear quest, and its advanced missiles pose a greater threat to Israel than ISIS, al-Qaeda, al-Nusra Front, or other Sunni Salafi extremists. It is an existential question for the Jewish State. And the Obama administration appears all too eager to strike a deal with Iran that would leave them with the potential to breakout toward nuclear weaponization. This is the scenario that keeps Israeli and most Sunni Arab leaders awake at night—the fear that President Obama will celebrate a nuclear deal with Iran that does not come close to satisfying Israel's and the more moderate Sunni Arab security concerns. Another option as the clock continues to tick is yet another extension of the talks. But these interim agreements are not freezing Iran's nuclear production or leading toward an end to their program. Instead, it is codifying Iran's progress on the path to a bad agreement. And further extensions provide Iran with additional bargaining chips and concrete achievements while America's leverage diminishes. Today, the U.S. position would reportedly restrain but not eliminate Iran's ability to produce nuclear weapons. The time-limited deal would allow Iran to preserve substantial sections of its nuclear infrastructure—including 4,000 or more centrifuges— leaving it capable of breaking its commitments and fashioning a bomb before the West would even have a hint. Verification of Iran's compliance and enforcement of material breaches would also prove nearly impossible, even in the best of circumstances. In such a deal, key program components would be left like a child's toy whose parts have already been manufactured and merely require assembly. This is what a deal looks like and it is worse than no deal at all. 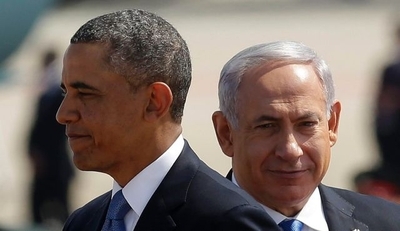 Into that breach Benjamin Netanyahu will step when he arrives in Washington in March. President Obama has all but declared that if the nuclear talks fail, the fault will lie anywhere but in Tehran, the White House, or Foggy Bottom. As for Congress, it's never a ringing endorsement when legislators call upon a foreign leader to stand where the president stood not 12 hours earlier and make the case for a more robust American foreign policy. The invitation does just that, perhaps a result of the president's decision to circumvent Congressional approval of a final deal. Netanyahu will have to tread carefully while considering the possible costs and benefits of what would otherwise be a straightforward speech. Historically, an address from an Israeli leader at a joint session of Congress is an honor and opportunity to reaffirm the similar values and close bond that exists between the two countries. During the heyday of the Palestinian-Israeli peace process in the 1990s, Israeli Prime Ministers Yitzhak Rabin, Shimon Peres, and Benjamin Netanyahu spoke before Congress in 1994, 1995, and 1996 respectively. Netanyahu again returned in 2011 and laid out the issue of Iran's nuclear program as seen from Jerusalem. When Netanyahu makes his third appearance in the House Chamber, the political and strategic gap between these two leaders will again be thrown into stark relief, with ramifications echoing in both countries' foreign and domestic policies. Given recent history, that makes less for a song sung in harmony but rather a cacophony of voices as the gap appears too wide to bridge.